Facebook, the most popular social network out there, boasts a whopping 1.7 billion users worldwide. While a great place to stay connected with your friends, Facebook is also an extremely popular platform for business as well; over 41 percent of small businesses report using the site in one way or another as a matter of course. Despite its popularity, many companies are often reluctant to take the plunge and establish a presence on Facebook. They shouldn’t be, and there are 1.7 billion reasons why you need to get your business on Facebook as soon as you can. 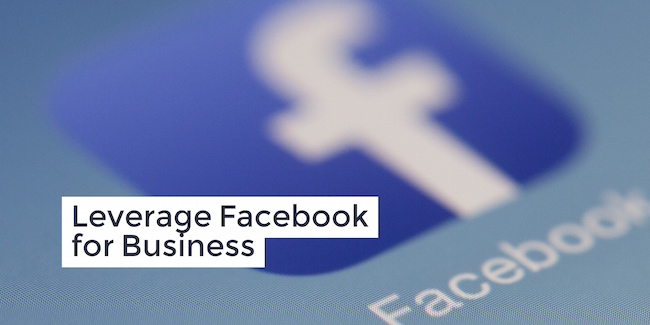 Here are four great tips that leverage Facebook to make your business more successful. People often don’t associate advertising with Facebook, but the company is truly on the cutting edge of marketing. Facebook makes it really easy to design and activate an ad for your business. It also lets you determine the type of audience you want to market to, and its algorithms adeptly place the ad with the kind of people deemed best suited for your particular product or service. Facebook’s ad service also lets you set the exact price you want to spend on your ads (which determine the length the ad runs as well as the ad’s reach). There are also numerous third party companies that can place ads for you on the platform as well. Don’t knock that Facebook page that everyone has to like to look at. A page for your small business is, outside of your products or services themselves, one of the best places to establish what kind of company you are. You can speak to an audience of customers, potential customers, and like-minded souls, and get them all interested in what you are selling. You can share pictures and videos of your company painstakingly creating your products, showing the high level of craftsmanship that goes into each one. You can link to a major event or activity where your products will play a key role. You can “like” experts or leaders in your business’s niche, and imply that you are one of the niche’s leaders as well. All the while, as you tell the story, you will generate greater interest in what it is your company sells. And that will only help raise the bottom line. Beyond advertising and building your brand, you can actually use your Facebook presence to sell products and services, too. Facebook itself allows you to easily set up a storefront to showcase and sell your products. There are other third party services that can do the same, and offer even more sophisticated products and services. Establishing a store, after experimenting with ads and building a good Facebook page, may be the perfect evolution for your company’s social media presence; once you have people liking the page, give them a reason and an easy way to buy your products or services right away. You work real hard to attract customers and make a sale; Facebook can help keep your customers happy, so they come back again and again for your products or services. Your presence on the site – whether through your actual page, a discussion board you establish, or through messenger – will give your customers an opportunity to speak directly to you. They will be able to ask questions about your products or services (which may lead to more sales), or to give you advice about making them better. Your page will make it much easier for them to immediately bring any problems to your attention, which is a good thing, since you will be able to address any issues they have more rapidly than if they had to go to your customer service desk. Overall, your customers, through your Facebook page, will have a more immediate, responsive relationship with you than they ever would though just a storefront experience alone. Facebook is a tremendously powerful platform, and can help your company achieve things that it could never do by itself. Take some time to study the site’s business tools so you learn the best practices for placing ads, building pages, operating storefronts, and interacting with customers. One you are ready, get on the platform, and start building your presence for all of Facebook’s 1.7 billion users to see.